Lovely Old Rose Gold Oval Patterned Cufflinks, 1913 [SH8019] - £185.00 : loveVintageDiamonds.com, Your Vintage Diamond Dreams Come True! 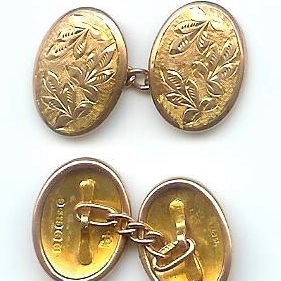 These double-oval and chain cufflinks are beautifully hand-engraved with a leaf design. They are rose gold and are fully hallmarked on the reverse, confirming that they are 9ct gold and were hallmarked in the Birmingham assay office in 1913....truly charming!